Well, there’s good news and not so good news. I’ll start with the bad news, shall I, and get it out of the way? 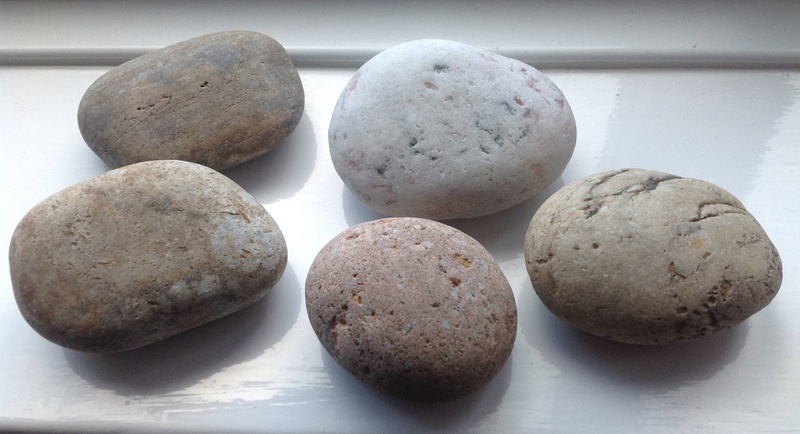 Well, would you believe that I’m running out of pebbles. Yes …. 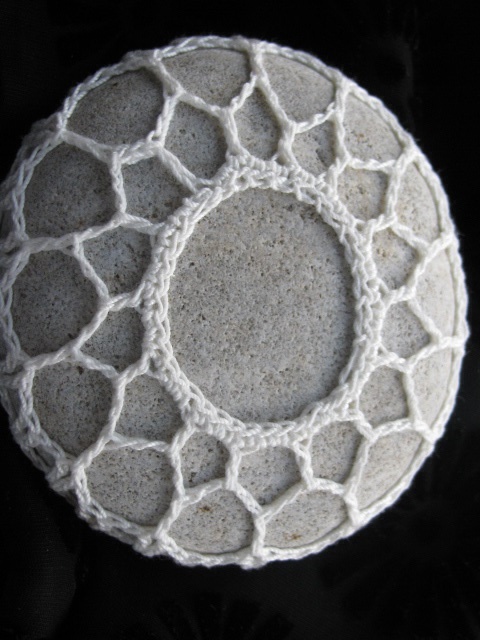 that huge bag of North Sea Cobbles is almost at an end and what’s more all the best of them – round and symmetrical – have gone, leaving behind some rather quirky shapes which are proving quite a challenge to cover. More on that subject later! 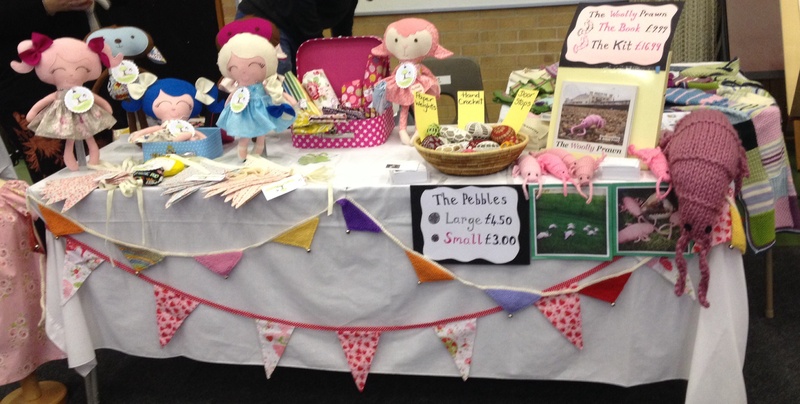 Now to the good news …. 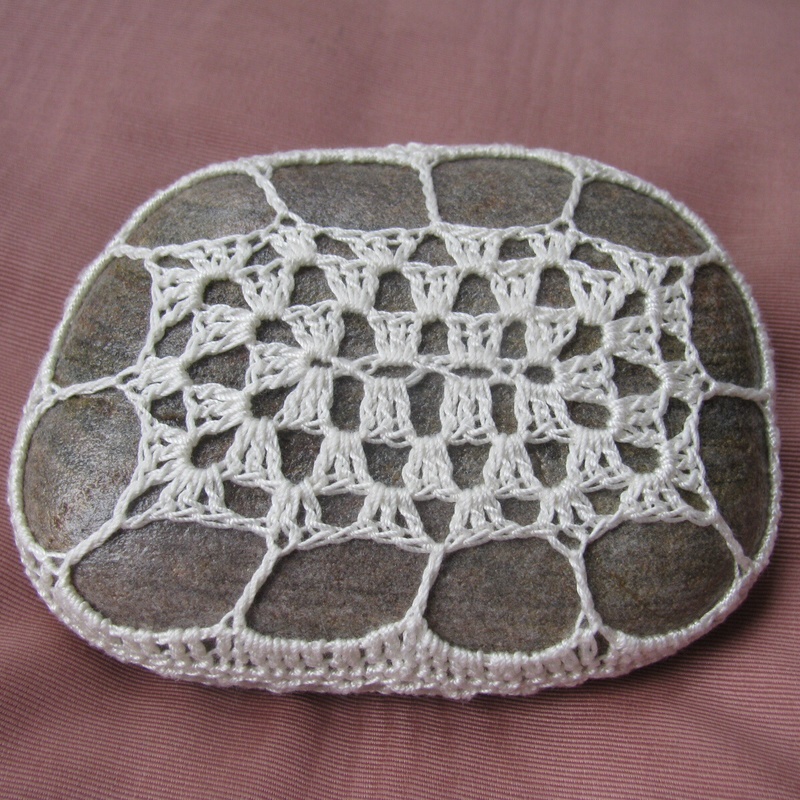 I’ve found a product which transforms the rather grey stones into a far more acceptable pebble to crochet around. 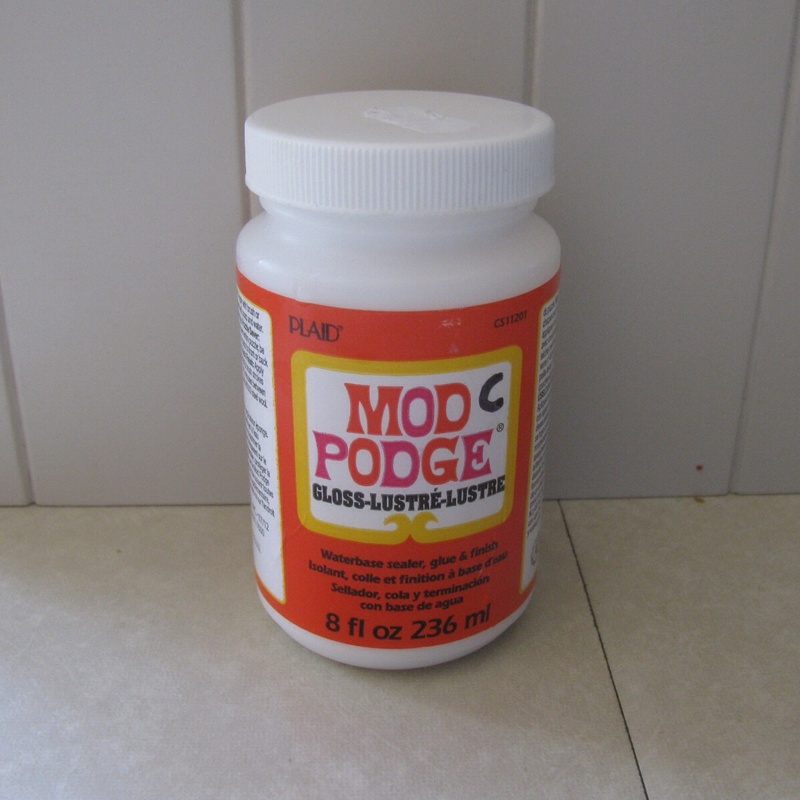 A most helpful young man at our local Post Office came up with the idea of painting the stones with Mod Podge – yes, that really is what it’s called – to enhance the colours of the rocks. You know how much more attractive pebbles look when wet – well, it doesn’t quite reproduce that look but it definitely helps. 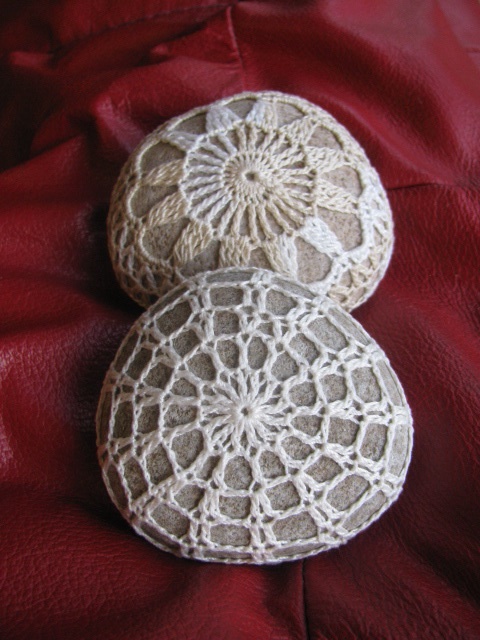 So, with some unusual shapes lined up I have been searching the internet for some appropriate shaped motifs to use. 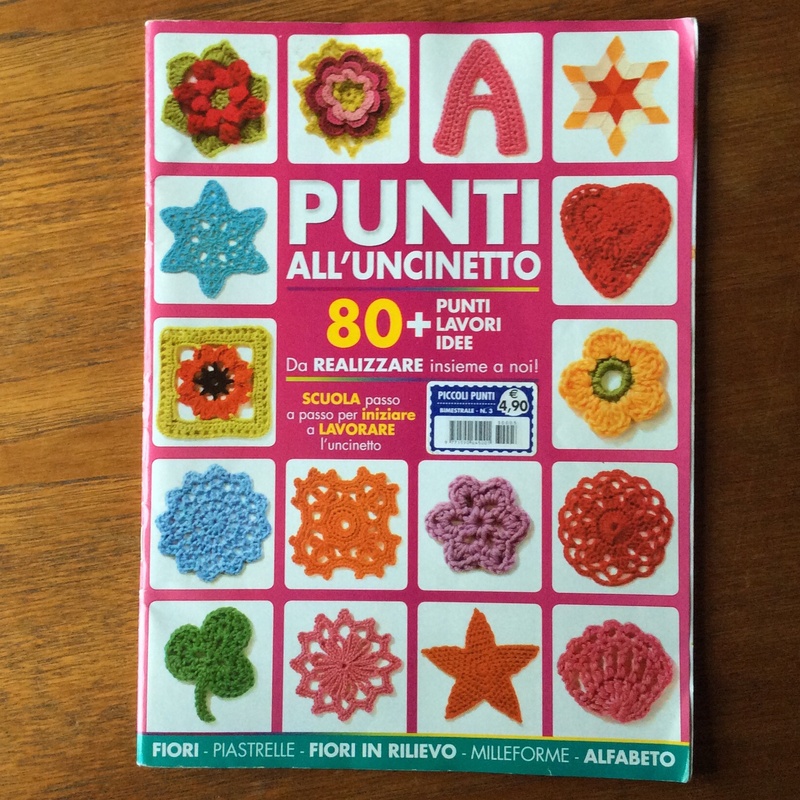 I’ve seen images of beautiful designs …. leaves, ferns, swirls and other fantastical shapes … But there are never any patterns for them. 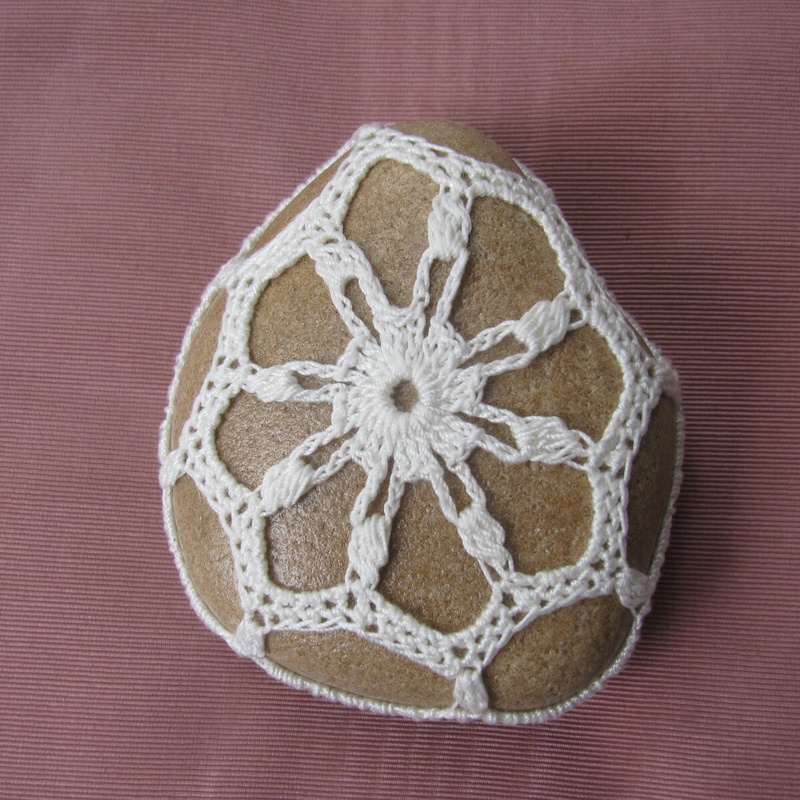 The problem, you see, is framing the central motif in such a way that it enhances the shape of the pebble. 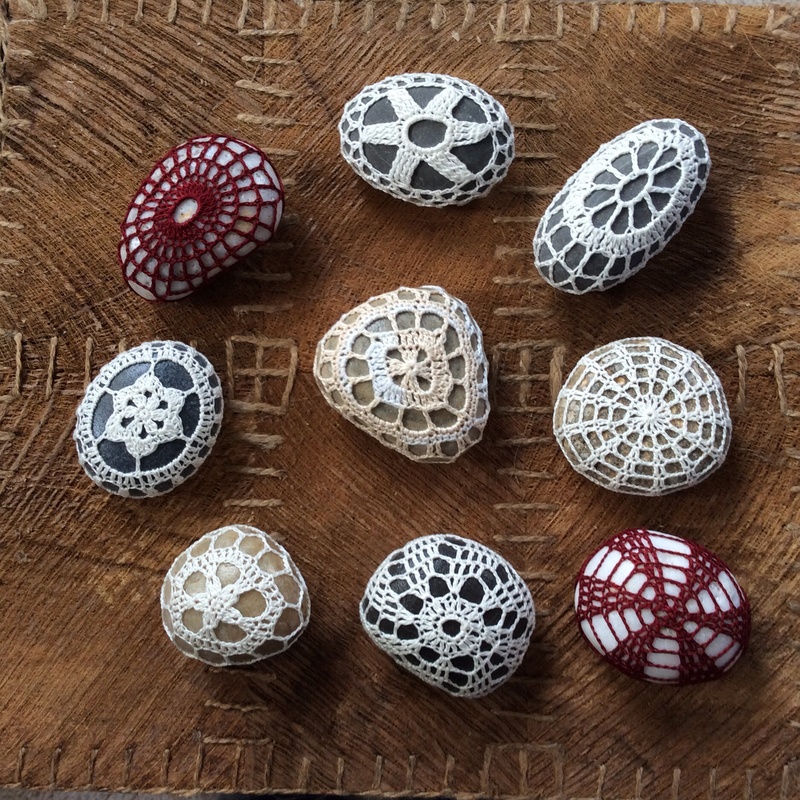 The perfectly round patterns which I started on last autumn work well but now I want to create something different for each stone. 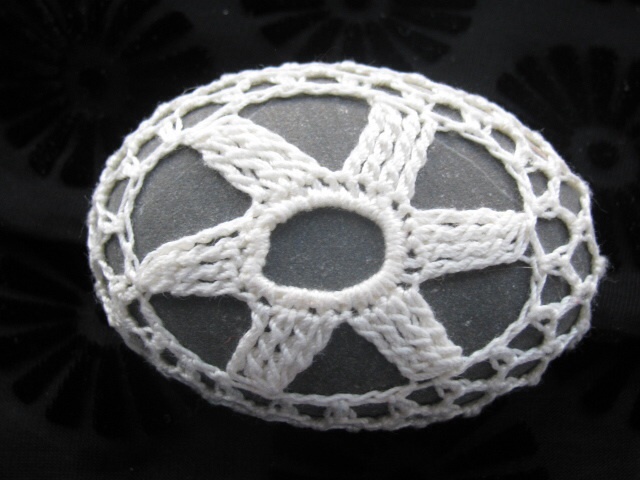 It’s become a bit obsessive and I have taken to scouring all my crochet magazines for different motifs and doily centres which I can adapt to the shapes of my stones. 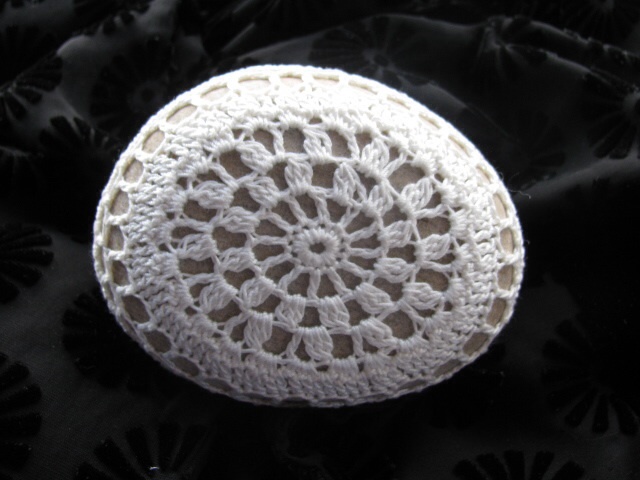 My attempts at covering a rather beautiful oval shaped stone have not achieved quite what I wanted: having spotted and worked a leaf outline design from the beautiful new book Natura’s Crochet Flowers I was disappointed to find the finished result too fussy so that the central motif is lost. This is one pebble which is about to be uncovered! 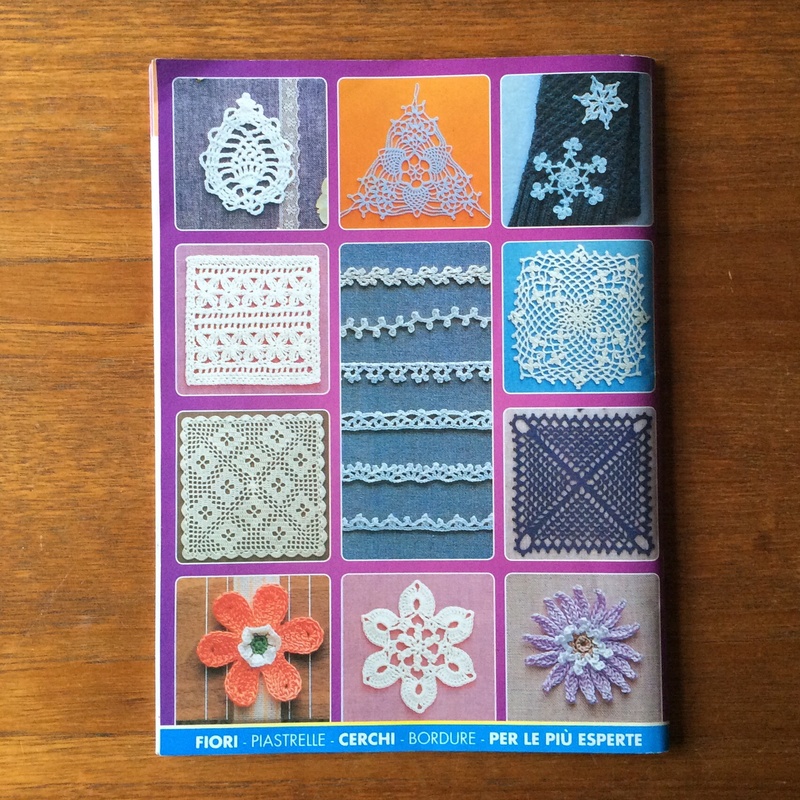 Some have turned out better, though, and I shall certainly be trying the windmill, spider’s web, spiral cross, snowflake and granny rectangle again. I can’t quite believe I have now made twenty-one different covers and even the designs which I have made more than once look different each time. 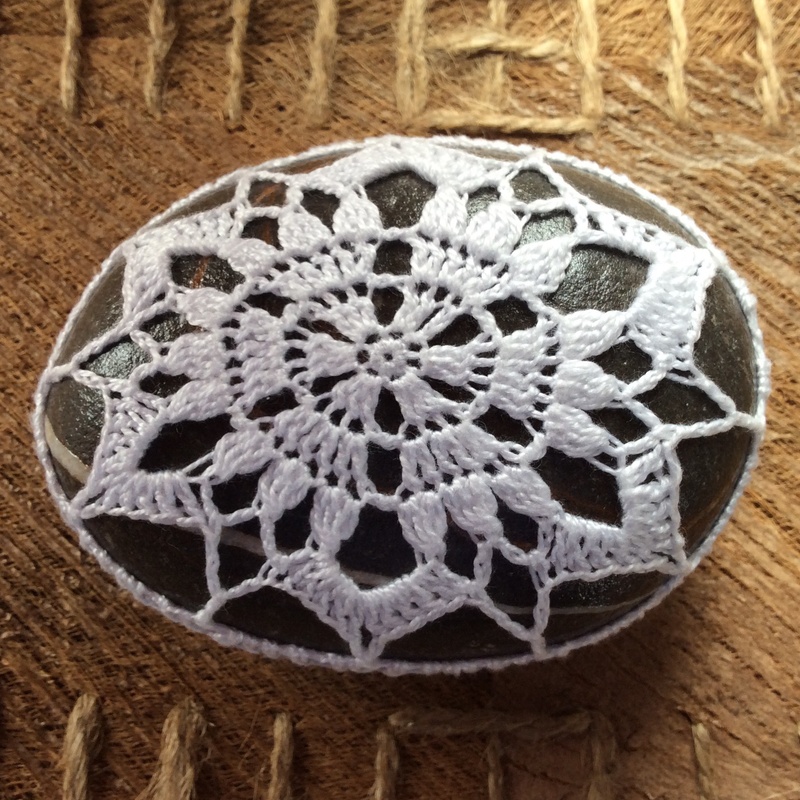 For anybody who really does want to see the designs I’ve used so far – all my covered pebbles can be seen on Pinterest here. So, that’s all for now. I’m off on a large pebble hunt. 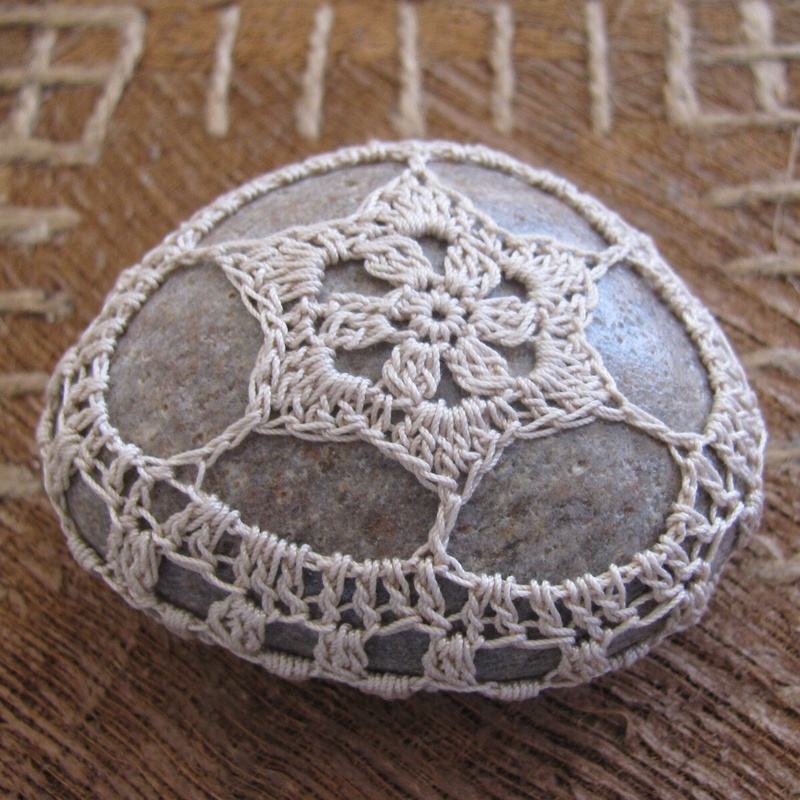 It’s hard to believe that a scrap of cotton crochet can transform a stone into a thing of beauty. 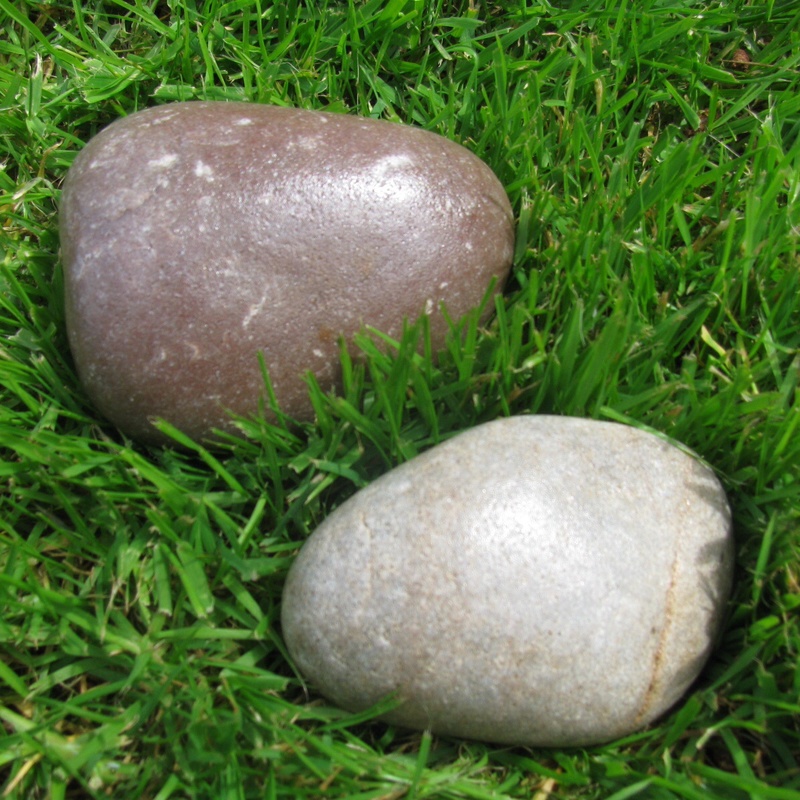 Admittedly they are those most sought after North Sea cobbles but nevertheless …. 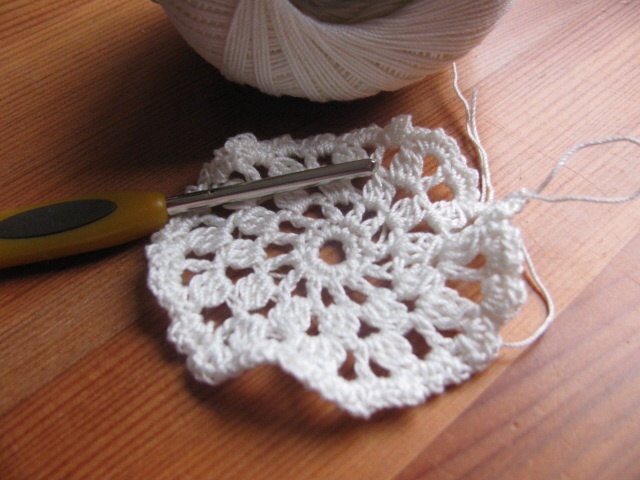 I just pootle along with a bit of thread and a tiny motif, adding a round of double crochet here a few chain there until the cover looks big enough. Then comes the moment of truth …. 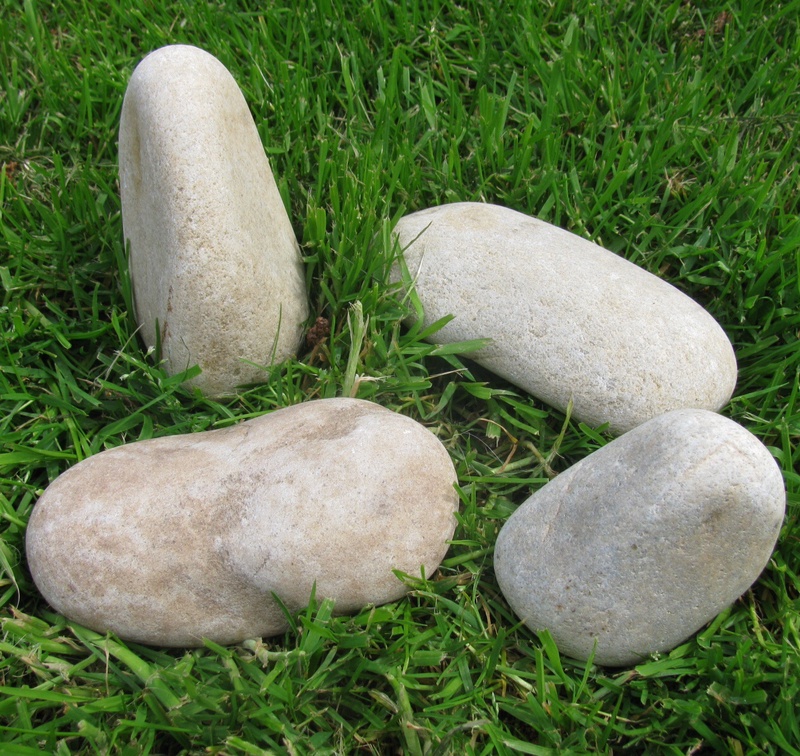 which stone or pebble will fit best inside? A tug at one end, a little easing at the other and it’s in, ready to be secured with a couple more rounds. 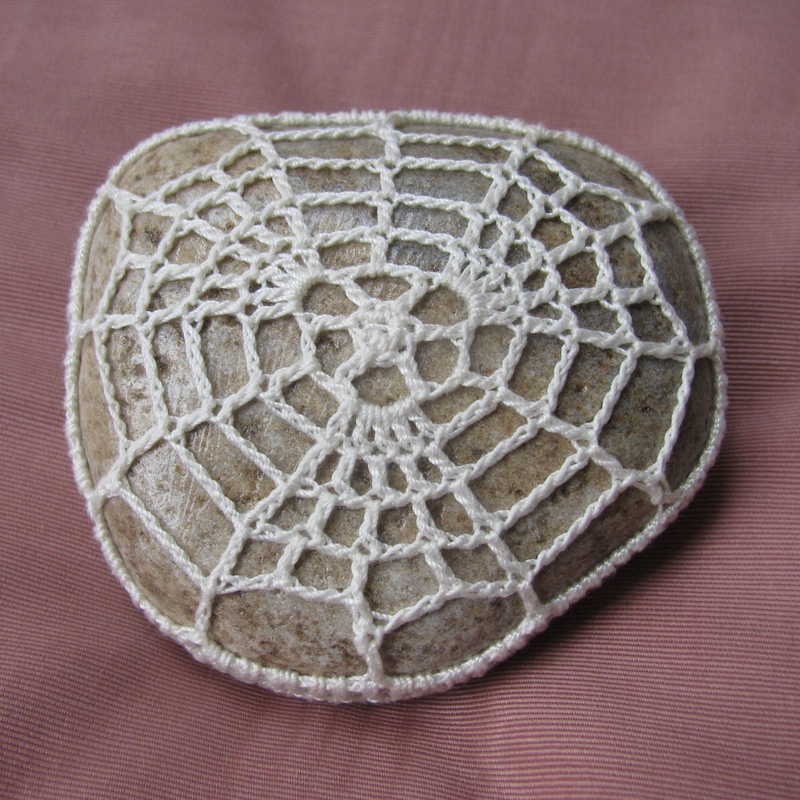 Suddenly, what was just a trial piece is too nice to undo and so another crocheted stone appears on the hearth! …. 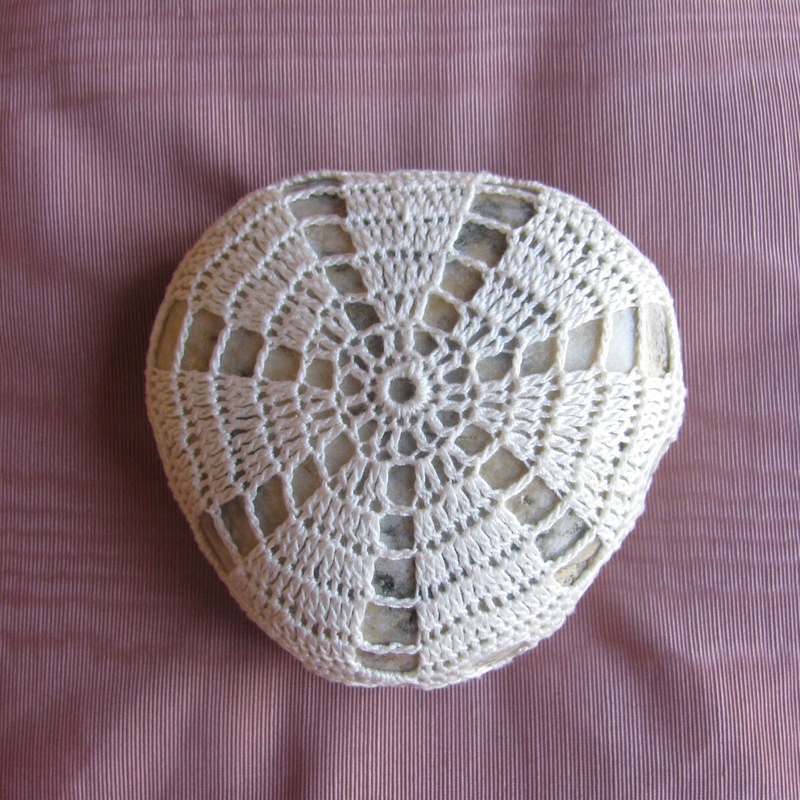 And another one – these are addictive! 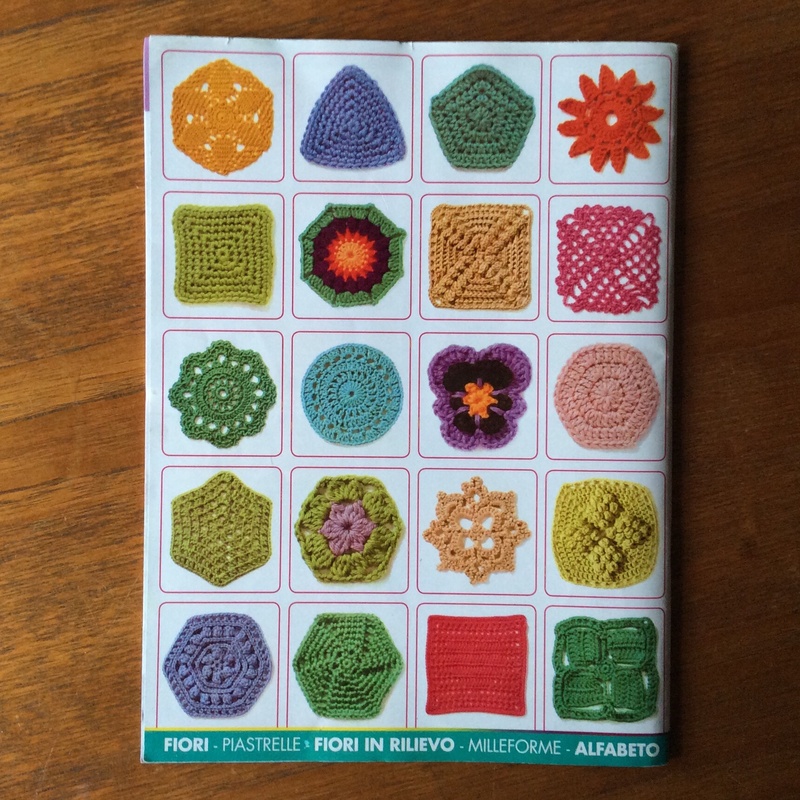 There have been a couple of patterns in Crochet magazines recently … this design by Ros Badger featured in Issue Ten of Simply Crochet. 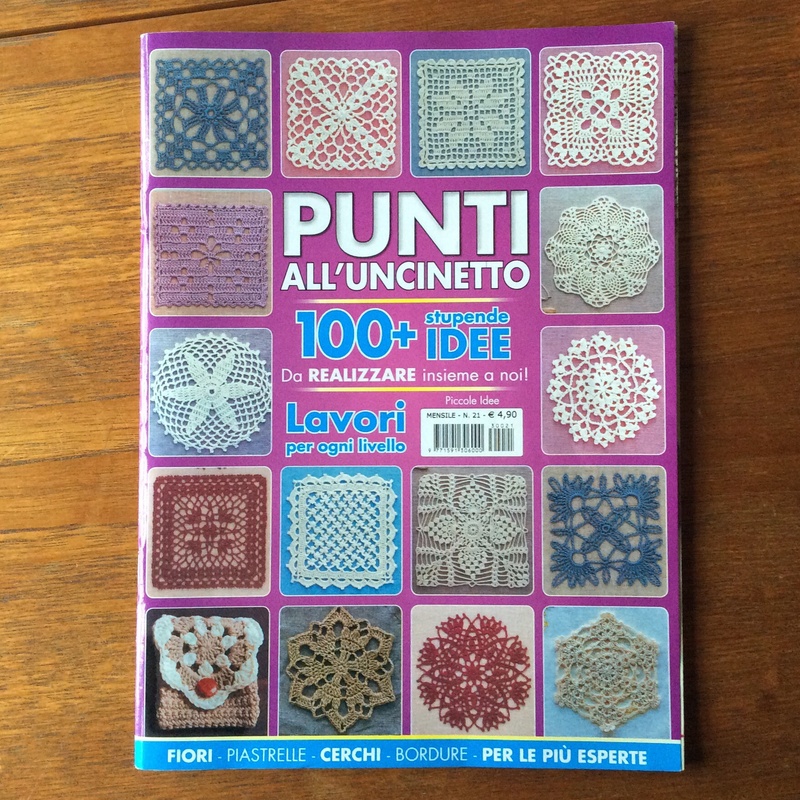 I also found some online: Margaret Oomen has a few super patterns such as Sunburst, Shamrock and Radii on her website but others don’t seem easy to track down. 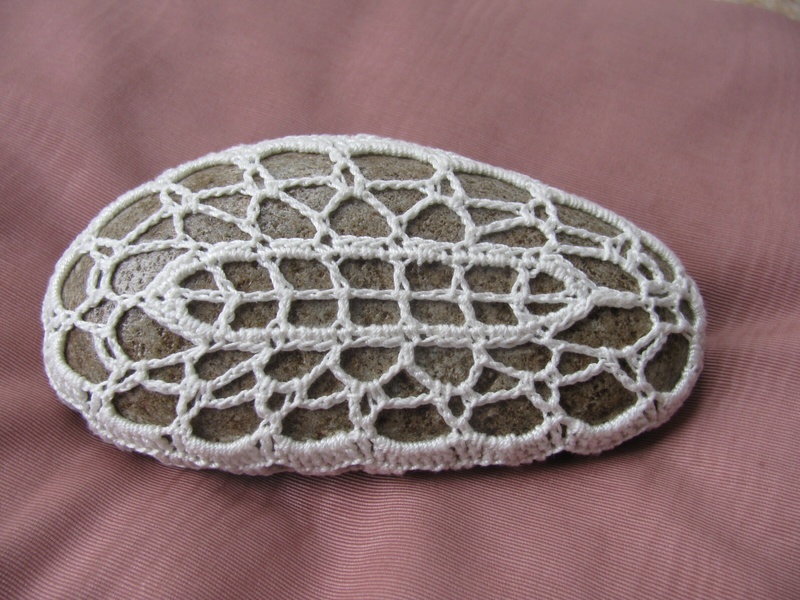 This is frustrating because the detailed lacy patterns on these pebbles on Pinterest and other sites are so lovely that I just want to be able to try them myself. 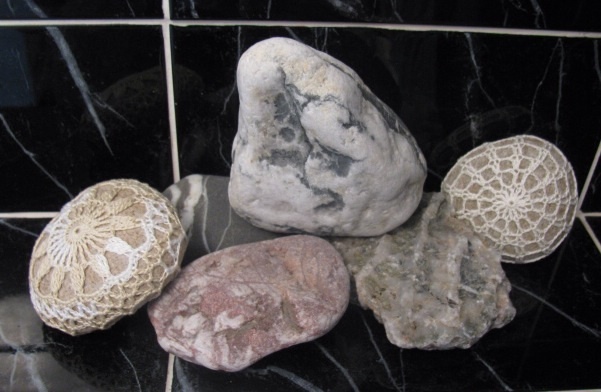 I covered two stones for my daughter last week and they blend very well into her bathroom rock collection. What’s more the backs of these stones are beginning to look a bit more professional – less trial and error involved as I get used to the shapes. 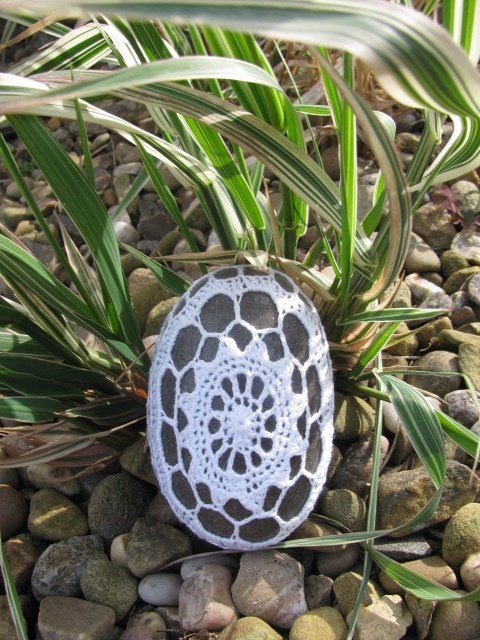 These covered stones are so lovely to do as each one turns out slightly different from the rest and the colours and shapes vary such from stone to stone. The other satisfying thing is that one can be completed in an evening. Well, I’m off now to keep track of my other projects.